Our talks can be fully illustrated and we can provide all the necessary equipment. We have been featured on Radio 4 several times including Gardener's Question Time (go forward to 28 mins) and The Food Programme (go forward to 12 mins 35 secs). The below is our list of "off-the-shelf" talks, though we have a large photographic library and can adjust these or create new ones if required. 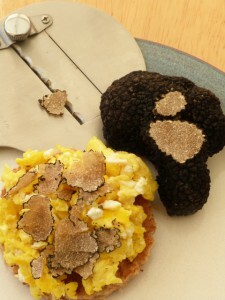 English Truffles - To be sniffed at! Yes, truffles can be found in England and no, I don’t use a pig! These are the two usual questions I get asked. The talk will cover truffle biology, history and species as well as discussing finding, growing and eating them. Illustrated with computer slides. Food for free: Foraging for wild food An illustrated talk on foraging and finding wild foods. After an introduction which includes safety, sustainability and the law, we take a tour through the seasons via a detour to the coast, to look at the wild food that can found and what can be made with it. Illustrated with computer slides. The Magic of Mushrooms There is far more to fungi than just eating some of them. If you think you know the largest, the oldest living or fastest organisms on the planet, you might be in for a surprise! Their current and future potential uses are stunning. The talk gives a look into the fascinating fungi kingdom - thrilling, magical, remarkable, and exquisite. Illustrated with computer slides. Please contact us for more details, providing the date, location, expected size of audience, required duration etc.